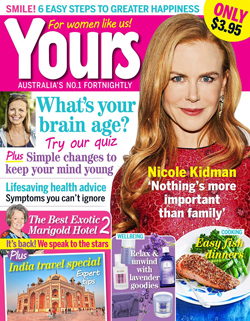 Yours is a fortnightly lifestyle magazine and website. It targets the 50 plus market with 67% of its readership over 65. Its profile is female (89%). Editorial covers health, news, fashion and beauty with an emphasis on affordability and wearability. It targets the mid market with an ABC1 readership of 45% and C2 at 28%. Yours magazine is responsive. Every issue carries a number of off the page and response advertisers. It accepts inserts too.